The search functionality of evernote is rather weak, IMHO. This is example. I bookmarked a page which contains "ohio" and a name in its link. However, when I searched for it, the list didn't contain this link. I just searched "ohio" and the name. Was there anything wrong in my operation or there were better solution, or bookmarked page couldn't be searched for? Hi. Evernote's search grammar specifies what will and will not work in certain situations - it's possible forinstance to search for the beginning of a word, but not embedded or following text. It's also not possible to search for links or bookmarks within a note, unless you can create a suitable 'keyword' like X_ohio and add that to the text at a suitable point. Long notes however display from the start so while searching for X_ohio should highlight any keywords found, they still may be hidden below the visible area of the note. Ctrl-F (Windows) will search within the note and scroll down to each keyword found. I assume when you say you bookmarked a page, you used the web clipper and clipped a page as bookmark into Evernote. Is that correct? When you save the bookmark like that, Evernote will list the link as it is in your address bar and search will find it with no issues. The search functionality of evernote is rather weak, IMHO. The screenshot is an example of searching on my Mac. Thanks for your replies and sorry for my delayed reply. When I searched for "ohio dey", the search results didn't include the note. When I searched for "ohio-state dey", the results looked similar. It seems that Evernote didn't index the source URL. I have several recommendation for Webpage Evernote. 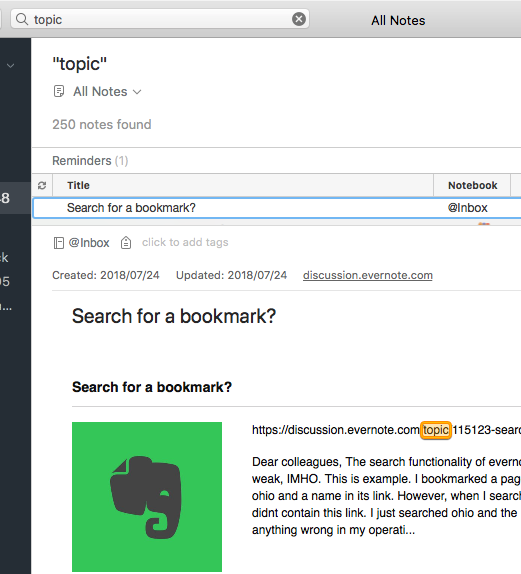 2. distinguish bookmarks from common clips, otherwise there is meaningless to have a bookmark functionality in the "Clip to Evernote" extension. Hmmn. After a quick test on my database, it appears that Evernote doesn't index the URL unless it appears in the body or title of a note (or an attachment) - ie if the URL is in the note metadata - it's not included. Also if you searched for "ohio dey" including the quotes, that searched for the exact phrase. Trying without quotes should get you the same result - .ohio and ~dey being words preceded by a space as far as Evernote is concerned - full stops and tildes aren't indexed. I had the same need of filter notes by "kind", specifically to see only notes added as bookmarks using the web clipper tool. In the Grammar page (included in previous answers) I found that by typing "source:web.clip" in the search field I got what I wanted. There is also options for filter notes added by mail, etc..
Matches notes that were delivered to the service via the email gateway. Matches notes that were created on an iOS client of some form. Matches notes that were created on an Android client of some form. Matches notes that were created on a mobile client of some form.